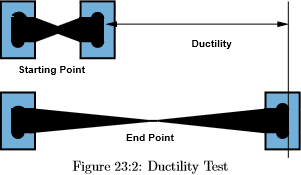 Malleability and ductility are related. A malleable material is one in which a thin sheet can be easily formed by hammering or rolling. In other words, the material has the ability to deform under compressive stress. A malleable material is one in which a thin sheet can be easily formed by hammering. Gold is the most malleable metal. In contrast, ductility is the ability of a solid material to deform under tensile stress. Practically, a ductile material is a material that can easily be stretched into a wire when pulled as shown in the figure below. Recall pulling is applying tensile stress. If we pull on a rod of material, some of the possible profiles of the rods at fracture are shown in the figure below. Profile (a) is an example of the material that fractures with no plastic deformation, i.e., it is a brittle material. Profile (b) is an example of a material that fractures after very little plastic deformation. These two profiles would be classified as having low ductility. Profile (c) in contrast is a material that plastically deforms before fracture. This material has high ductility. The stress-strain curves for the brittle, profile (a), and the ductile material, profile (c), are shown in the figure below. Now that you have learned a bit about the mechanical behavior of metals, please go to your e-textbook and read pages 75 to 84 in Chapter 4 of Materials for Today's World, Custom Edition for Penn State University to learn more about this subject. When finished with the reading proceed to the next web page.